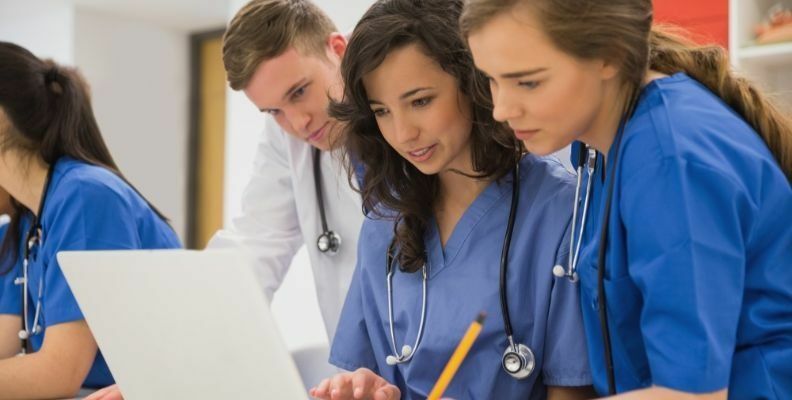 Nursing Degrees | Find Nursing Programs and Degrees Across the U.S.
With many different levels of nursing degrees available, choosing between them often comes down to what specialty and job title you seek. Nursing degrees aren’t one-size-fits-all, so you need to consider your career and educational goals. Below, we outline each of the various types of nursing degrees, from associate to graduate degrees, and explain the pros and cons of each to help you decide which degree is right for you. What are the Different Levels of Nursing? This page focuses on the nursing degrees, from associate to graduate-level. To learn more about Certified Nursing Aid (CNA) and LPN programs, you can visit those respective pages. Many nurses, especially during the nursing shortage, find that now is a great time to begin a career in the field and advance while collecting on-the-job experience. Read on to learn more about each degree level and what careers you can achieve with each level of education. An Associate Degree in Nursing (ADN) is the quickest way to join the nursing field as a Registered Nurse (RN). In fact, many students choose this degree because it allows you to begin working entry-level RN jobs in the field the quickest, and enables you to continue your education later for career advancement purposes. This degree choice is the most popular for RNs, and it typically takes around two or three years to complete the curriculum. With a rise in nursing jobs that’s expected to continue to grow in the foreseeable future, earning an ADN can help you gain experience quickly and possibly save on educational costs. If you plan to continue a nursing career for a long period of time and career advancement is your priority, this still may be a great option for you. Even if you decide to later earn your BSN, you can usually transfer the nursing courses you have already taken. There are also RN to BSN programs if you choose to advance further that are often available online. If you want to someday work in a hospital located in an urban area, which often pays well, and don’t mind attending around four straight years of college, you will want to earn your Bachelor of Nursing (BSN). A BSN nursing degree will allow you to become an RN through your formal education, and it is the degree most nursing leaders and employers prefer. In fact, this degree is the basic requirement for many entry-level nursing positions and is the prerequisite for nursing master’s degree programs. Nurses with a bachelor’s may also earn higher salaries and find job prospects easier. Bachelor’s degrees take around four years to complete, which is a serious commitment for many students. The coursework can require an extensive amount of time spent studying and learning in the lab, and most students don’t have time to work a part-time job while taking full-time classes. Some BSNs are available online, but they usually combine in-person clinical lessons at a hospital or campus while completing core classes online. A Master of Science in Nursing (MSN) is the level of education needed for a nurse to specialize in a particular area of care. However, completing a master’s degree takes hard work, and master’s nursing programs will require you to complete a thesis project to graduate. Most MSN programs take around 18 to 24 months to complete, and the courses are centered around your advanced specialty. Many nurses that return to earn their master’s degrees work a tight schedule, so there are online MSN programs available and employers often offer tuition reimbursement if you go back to school. Doctorate degrees, on the other hand, are designed specifically for careers in administration and research. If you want to advance your career to the next level and focus your area of knowledge down to a specialty, a master’s degree is the best choice for your career. There are many specialties in both direct or indirect care for nurses, which we explain in more detail below. If you want to join the administrative side of public health or work in hospital administration, there are lucrative careers available with an MSN that offer office jobs and high paying salaries. However, doctorate degrees are in high demand for these fields along with advanced clinical practice and clinical research. Certified Nurse Midwife – Assists with labor, delivery and prenatal care in gynecological offices or hospitals. Nurse Practitioner – Provides primary health care in a physician’s office, clinic, school, hospital, or private company, depending on the state. There are several NP specialties as well, from pediatric to psychiatric. Certified Registered Nurse Anesthetist – Assists the anesthesiologist during and before surgery, usually in a hospital setting. Clinical Nurse Specialist – Implements treatment plans for medical and psychiatric problems. Nurse Educator – Creates educational programs for healthcare workers. Legal and Policy – Works in a legal setting to advise professionals on healthcare facts, such as personal property damages. Clinical Nurse Leader – Creates health plans for patients and leads a team of nurses. Public Health Nurse – Works in a public health department as a specialized NP, like an adult acute care or women’s health nurse. Nurse Researcher – Focuses on the ethical areas of nursing and research factors in all aspects of health. Nurse Administrator – Often called nurse managers, they oversee nursing staff in healthcare facilities, clinics, and hospitals. Two types of doctorate degrees are available for nurses, both of which are expected to see a large growing demand for jobs in the coming years. Each degree prepares nurses for health administration, advanced clinical practice, or clinical research careers. Most programs take around four to six years to complete, and graduates are considered leaders in their field. A doctoral degree in nursing (DNP) helps you move into nursing leadership roles. Unlike a Ph.D. in nursing, which is required for teaching and research positions, this degree will allow you to focus on the clinical side of nursing. This degree is the highest possible level of education in the field, so it may allow you to earn the highest salary and become industry leaders. Most programs require you to already have a master’s degree to be accepted into DNP programs, as the curriculum builds on the master’s level education. If you want to work as a nurse manager or executive, for example, a DNP degree may be right for you. The high-level training focuses on clinical applications and research skills, and these positions are in high-demand. A Doctor of Nursing Philosophy (Ph.D.) is a graduate degree that emphasizes research and scholarly inquiry, and the goal is to grow the knowledge of nursing and health practices overall. Students in Ph.D. programs focus on advanced theory, chronic illness issues, research and data analysis, and the care systems we use today. Unlike other nursing degrees, there is no clinical aspect to obtain a Ph.D. However, teaching is required, and you will need to complete a thesis project. If you want to become a nurse scholar, research and advance the theoretical knowledge of nursing, or teach new nurses in the industry, this type of graduate degree may be right for you. These programs are best for students who enjoy traditional classroom settings, and many cannot work while attending classes. Upon graduation, you can become a leader in healthcare public policy or delivery. Graduates can shape the future of nursing, and you can’t do that with a master or bachelor’s degree.